This card came from a swap at Leadership in Orlando. 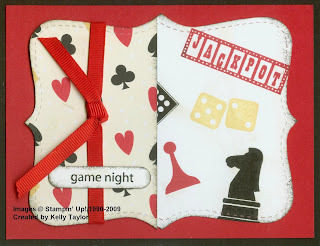 It uses the Jackpot Designer Series Paper, the Game Night stamp set and the Stampin' Up! exclusive Top Note Big Shot Die. Since its July introduction, Stampin' Up! has sold over 20,000 Big Shot Machines. You can see the Big Shot and more SU exclusive dies in the 2009 Spring-Summer Idea Book and Catalog. There are many ways to get the new catalog for free. You can hostess a workshop, join one of my stamp clubs or place your first online order in February. Regular cost of the catalog is $9.95. Come by one of my open houses on January 23rd or 24th to see more samples from the new catalog.